It’s Bastille Day! Vive la France!! As the 2014 Tour de France wound its way through the streets of Roubaix a few days ago, I found myself wondering what life must have been like for my Bonté and Heyman ancestors who lived in this area of France and in neighboring Belgium over a hundred years ago. Rain prevented the TV helicopters from showing the typically spectacular panoramic views of the countryside as the cyclists made their way from Ypres, Belgium to Arenberg Porte du Hainaut, France, but now and then you caught a glimpse of the centuries-old houses packed tightly together along narrow streets. Fields of flax, just coming into brilliant blue bloom, could occasionally be seen in the distance. It was this plant, Linum usitatissimum, that provided the livelihood for some of my Flemish ancestors during the 18th and 19th centuries. Operating mainly as a cottage industry until the mid-1800’s the growing, spinning and weaving of flax fibers into linen cloth provided a subsistence living to the rural folk of Flanders, in the northwestern part of Belgium. 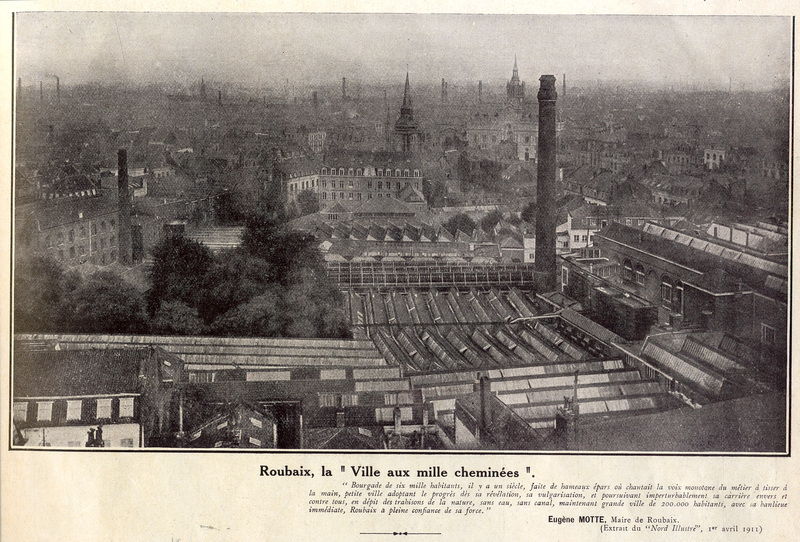 Read more about what life was like and how linen was produced on family farms, including some excellent photos and maps, at the Rootsweb Belgium website for Flanders and Flemish Brabant. If you have Flemish roots, you can get in touch with them every time you pull a US dollar bill out of your pocket. The flax fibers in that dollar bill come from the Vervaeke Fibre company of Kuurne, West Flanders, Belgium, and some of the flax is still produced there, according to a Latitude News article. Just across the border between Belgium and France are the French “communes” of Tourcoing and Roubaix. This area, also well-known for its textile industry, produced cloth mainly from wool. 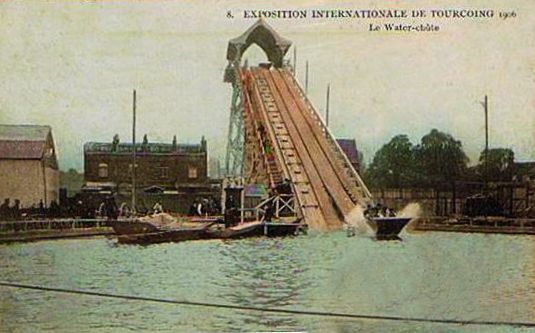 The water chute ride at the International Exposition in Tourcoing, 1906. I don’t know how my grandmother and grandfather met, but the romantic side of me wants to believe they fell in love over a glass of wine in a French bistro. What I do know is that they were both twenty-two years old when they married in Tourcoing on 11 September 1920. I am very fortunate to have the “Livret de Famille” given to them by the French civil authorities on the day they were married. Whatever you may think about French politics, I must say that French record-keeping definitely gets my vote! Births, deaths and marriages are recorded in great detail. In addition to the primary names and dates, the records usually include names of parents and witnesses, ages, occupations and places of birth. In some cases, the birth record also notes subsequent marriages. Ten-year indexes are available for many towns, making it easy to locate records by surname.This makes tracing a family back in time fairly simple, once you get past the problem of translating the record from French, or Flemish/Dutch in the case of some Belgian records. Records for the northeastern area of France, called the department du Nord, have been microfilmed and can be viewed online at http://www.archivesdepartementales.lenord.fr. Some records for Belgium can be found at http://www.Familysearch.org. 1 Tourcoing, Lille, Nord, France, Registre d’État-Civil, 1897, naissances [births], #1573, Louis Bonté; digital images, Archives Departmentales du Nord ,“Tourcoing /N, TA [1897-1897],” microfilm 1MiEC599R037 (http://www.archivesdepartementales.lenord.fr: accessed 27 June 2014), image 520. 2 Tourcoing, Lille, Nord, France, Registre d’État-Civil, 1857, naissances, #96-957, Gustave Désiré Bonté; digital images, Archives Departmentales du Nord, “Tourcoing /N [1855-1858],” microfilm 5Mi049R097 (http://www.archivesdepartementales.lenord.fr: accessed 19 June 2014), image 849. 3 Wattrelos, Roubaix, Lille, Nord, France, Registre d’État-Civil, 1863, naissances, #168, Leonie Dejonkere; digital images, Archives Departmentales du Nord, “Wattrelos /N [1860-1865],” microfilm 5Mi047R111 (http://www.archivesdepartementales.lenord.fr: accessed 19 June 2014), image 450. 4 St. Nicolaes, Oost-Vlaenderen, Belgique, “Register van Geboorten, voor het jaer duizend acht honderd vyf-en-zestig,” #538, Ludovicus Van Campen (later Heyman); digital images, Family Search, “Flandre-Orientale, registres d’état civil, 1541-1910” (http://FamilySearch.org : accessed 30 June 2014), Sint-Niklaas, Geboorten, 1865, image 163; citing Rijksarchief te Oost-Vlaanderen. 5 Croix, Lille, Nord, France, Registre d’État-Civil, 1886, mariages [marriages], #18, Louis Heyman and Jeanne Marie Peetroons; digital images, Archives Departmentales du Nord, “Croix /M [1867-1886],” microfilm 5Mi047R005 (http://www.archivesdepartementales.lenord.fr: accessed 30 June 2014), image 29. 7 Lys-lez-Lannoy, Lannoy, Lille, Nord, France, Registre d’État-Civil, 1893, naissances, #88, Clodius Joseph Heyman; digital images, Archives Départmentales du Nord, “Lys-lez-Lannoy /N [1893-1901],” microfilm 1MiEC367R002 (http://www.archivesdepartementales.lenord.fr: accessed 30 June 2014), image 20. 8 Lys-lez-Lannoy, Lannoy, Lille, Nord, France, Registre d’État-Civil, 1893, décès [deaths], #63, Clodius Joseph Heyman; digital images, Archives Départmentales du Nord, Lys-lez-Lannoy /M (1888-1903), D (1888-1904) [1888-1904],” microfilm 1MiEC367R003 (http://www.archivesdepartementales.lenord.fr: accessed 30 June 2014), image 602. 9 Leers, Lannoy, Lille, Nord, France, Registre d’État-Civil, 1894, naissances, #63, Leontine Heyman; digital images, Archives Départmentales du Nord, “Leers /NMD [1888-1899],” microfilm 1MiEC339R002 (http://www.archivesdepartementales.lenord.fr: accessed 28 June 2014), image 338. 10 Leers, Lannoy, Lille, Nord, France, Registre d’État-Civil, 1894, décès, #59, Leontine Heyman; digital images, Archives Départmentales du Nord, “Leers /NMD [1888-1899],” microfilm 1MiEC339R002 (http://www.archivesdepartementales.lenord.fr: accessed 28 June 2014). 11 Leers, Lannoy, Lille, Nord, France, Registre d’État-Civil, 1895, naissances, #68, Sophie Heyman; digital images, Archives Départmentales du Nord, “Leers /NMD [1888-1899],” microfilm 1MiEC339R002 (http://www.archivesdepartementales.lenord.fr: accessed 28 June 2014), image 389. 12 Leers, Lannoy, Lille, Nord, France, Registre d’État-Civil, 1898, naissances, #28, Jeanne Marie Heyman; digital images, Archives Départmentales du Nord, “Leers /NMD [1888-1899],” microfilm 1MiEC339R002 (http://www.archivesdepartementales.lenord.fr: accessed 28 June 2014), image 543. 14 Manifest, S. S. Lapland, 16 May 1923, list 4, page 185, line 21-23, Louis Bonte, Jeanne Bonte, and Marcelle Heyman; digital images, Ancestry.com, “New York, Passenger Lists, 1820-1957,” (http://search.ancestry.com/cgi-bin/sse.dll? indiv=1&db=nypl&h=4027536922: accessed 13 July 2014). Who was Albert Emerson Askew? This work by L. Sanders is licensed under a Creative Commons Attribution-NonCommercial-NoDerivs 3.0 Unported License.